9/7 WKND: Weisner, Deluca course records at PTXC5 (new vids), NA Boys Dominate 60 Team Field @ RWB! 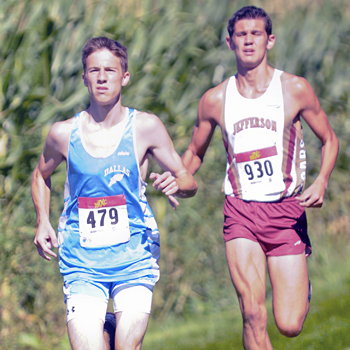 A pair of Class AA state qualifiers from 2012 took top honors at Harrison Hills Park in leading their teams to victory. Preston Carlsson of Knoch turned in a 16:39 to win the boys’ race, while Greensburg-Salem’s Laura Rosner went 19:41 for first in the girls’ event. The runners-up in both races – Knoch’s Brandon Grumski (16:43) and Freeport’s Becca Dudek (19:51) – also competed at Hershey last November. Northeast Bradford boys started their Class A team title defense with a convincing victory at the Wyalusing Lasagna midweek invitational. Led by a gold medal performance from Levi Upham in 16:04, Northeast Bradford had three of the top five overall finishers and five in the top eleven to score 31 points and win by 40 over host Wyalusing Valley. Nick Sweet of Sayre was the runner up, ten seconds behind the winner. For the girls, Mansfield's 1-2 finish from Violet Learn and Simone Lichty (19:45 for both runners) was enough to hold off Sayre for the team title 50-57. Sayre had three finishers in the top ten, while the winners Mansfield had five inside the top 20 overall. NASCAR starts out each season with its biggest event. Saturday at Schenley Park in Pittsburgh, cross country in western Pennsylvania put its crown jewel on display with the Red, White & Blue Classic. And what a classic it was. Fox Chapel Area’s Colin Martin and Mt. Lebanon’s Kelsey Potts turned heads with their victories, while North Allegheny’s boys wowed with their 20-second spread and the Mt. Lebanon girls finally got the best of West Virginia’s best. Tight packs are nothing new to strong teams and standout programs, and North Allegheny has had its share of miniscule spreads between its scoring runners. In 2012, the Tigers had just 17 seconds between their top five and 1:06 between runners Nos. 1 and 7 at Red, White & Blue. On Saturday, they took it to another level in dominating a 500-finisher field. John Neff’s squad put its scoring five in a row as North Allegheny’s black and gold uniforms ruled the front of the field in defending their overall team title with just 30 points. Runner-up Mt. Lebanon was a distant second at 155, while Fox Chapel Area grabbed third at 193. “I think the guys ran really well today,” Neff said. “They showed up. They wanted to prove to themselves that this is going to be another good season, and I think they did. In claiming their seventh team title in the meet’s 10-year history, North Allegheny did something it had not done before – drop below 50 points. In leveling its previous best of 56 from 2008, the Tigers did it with a row of runners. Junior Matt McGoey led the Tigers in fourth at 15:45, and he was followed right behind by senior Cordon Louco (15:49) and juniors Seamus Love (15:57), Scott Seel (15:58) and Hunter Wharrey (16:05). Senior Nicholas McClure was 11th overall in 16:16, and junior Peter Savchik was 16th in 16:27. Although its title defense was never threatened, North Allegheny didn’t carry the blanket finish for the entire 5,000 meters. As the field started its climb toward the final flat and fast loop, Tiger runners were Nos. 4, 5, 6, 8, 12, 13 and 21. As their coach later said, they knew they still had work to do. “More than anything else I think that this race shows you you’ve got to be tough at the end,” Neff said. “The finish here is nothing like Hershey, but I don’t care what race it is, what course it is, you still have to be tough at the end, and you’ve got to pass people and you have to hold your place. To keep the team championship from crossing state lines for another year, the Mt. Lebanon girls knew what they needed to do and who they needed to beat. Their game plan made it abundantly clear. Led by overall champion Potts, the Blue Devils ended Morgantown’s out-of-state reign by placing three in the top 10 and finishing with 92 points. The Mohigans were second with 119, while North Allegheny placed third at 192. Senior Jillian Hunsberger was fifth in 18:13, and classmate Audrey Gordon placed ninth in 18:59. Add in sophomore Claire Dougherty (39th, 19:50) and senior Callie Gunzenhauser (40th, 19:51), and the Blue Devils were solid winners. “They’re a great team, we knew that coming in here,” Morgantown coach Mike Ryan said of the 2013 champions. “Their top three we saw them in track, they had great track seasons. It was going to be a tough race for us. The Mt. Lebanon coach said Potts crossing the line first was the key to his team’s victory. Along with his twin brother Ethan and Kiski Area senior Brent Kennedy, Fox Chapel’s Colin Martin spent a lot of time in or near the lead of countless races during the 2013 track season. More often than not, the end result was a fast time and high finish but not being first to the line. That all changed in a big way Saturday as Colin Martin ran one of the fastest times on the 3.1-mile course in leaving his talented competitors to fight it out for second. The eventual winner was able to maintain the top spot all the way to the finish ribbon, which he broke in 15:18 to Kennedy’s 15:25 and Ethan Martin’s 15:35. Colin Martin’s performance is the fourth fastest on the Schenley Park layout, with the 15:13 by Lucas Zarzeczny of Avonworth in 2006 being No. 1. “During track, Ethan had my number most of the time,” Kennedy said of the friendly competition with the Martins. “I’ve got to be honest, I was waiting for Ethan to go after it. As they made the final climb toward the Schenley Oval and the finish line, Colin Martin turned to take a quick look at his pursuers. What he saw was a 30-meter gap that was never seriously threatened. “I took about three,” the winner said of his glances back at the field. “I’m told never to do that, absolutely never, but I was very nervous. This is the second time I’ve beaten Brent and the first time I’ve ever beaten Ethan, and being in front of them scares me. With the season only two weekends old, Colin Martin expects the rivalry between western Pennsylvania’s top three boys will continue to grow. With defending champion and state 1,600-meter titlist Brianna Schwartz of Shaler Area sitting out the race, the door was wide open for a runner looking to make a name for herself. And Mt. Lebanon’s Potts took full advantage of the opportunity. “It jumped out at us,” Mt. Lebanon coach Ron Schreiner said of Potts running 17:47 and breaking Schwartz’s 18:07 record from 2012. “We have two seniors that train hard with her, Jillian Hunsberger and Audrey Gordon. I think it really has helped Kelsey as a sophomore in practice. Last year Kelsey was all brand new (and) really didn’t know how to spend her energy where on the course. With just over 1,000 meters left, Potts was in front but followed closely by Vincentian Academy’s Marianne Abdalah, North Allegheny’s Madeleine Davison, West Allegheny’s Alexis O’Shea, teammate Hunsberger and North Hills senior Mary Malone in a single-file line. Potts then made what proved to be the deciding move. “I tried to surge mostly as we were coming up the hill, and then I kept that and then I sprinted the straightaway,” she said. Abdalah, a freshman, was second in 17:49, with Davison third in 17:55 and O’Shea next at 18:05 as four ran better than the old course record. The record time came as a surprise to Potts. “Yeah, I was planning on getting 18 flat or 18:05,” she said. 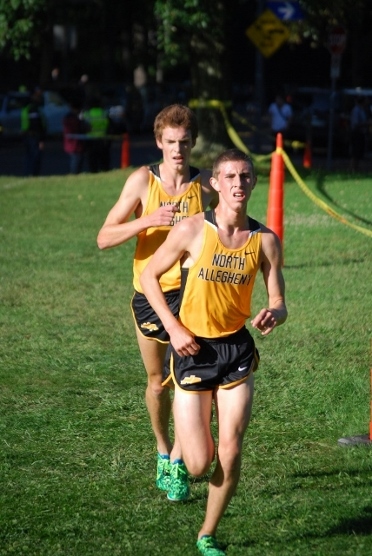 Flash Summary by Phil Grove: Colin Martin, Kelsey Potts and the North Allegheny boys and Mt. Lebanon girls walked off with top honors at the Red, White & Blue Classic at Pittsburgh’s Schenley Park. 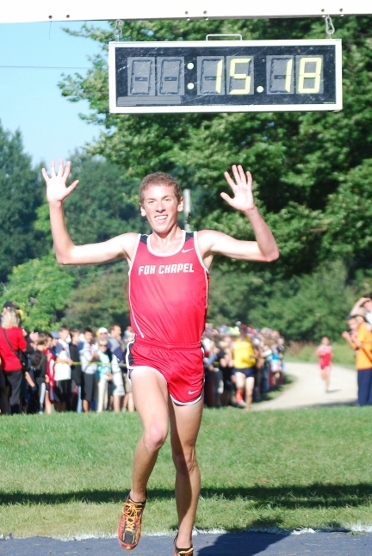 Fox Chapel’s Martin was the first varsity winner of the day, covering the 5,000 meters in 15 minutes, 18 seconds to best Kiski Area’s Brent Kennedy (15:25) and twin brother Ethan (15:35) in another battle of western Pennsylvania’s top trio. The next runners to cross the line wore the black and gold of North Allegheny as the Tigers dominated the field of 500. John Neff’s squad claimed the overall title with just 30 points as its top five were separated by only 20 seconds. Throw in runners Nos. 6 and 7 and the Tigers occupied fourth through eighth along with 11th and 16th overall for a total spread of 42 seconds. Junior Matt McGoey led John Neff’s team in 15:45, followed by senior Cordon Louco (15:49) and juniors Seamus Love (15:57), Scott Seel (15:58) and Hunter Wharrey (16:05). Mt. Lebanon was a distant second overall with 155, while the Martins lifted Fox Chapel to third with 193. In the girls’ race, Mt. Lebanon’s Potts was a surprise winner, blasting through the sunshine in a meet record 17:47 as the Blue Devils avenged Red, White & Blue losses to Morgantown (W.Va.) the past two years. Seniors Jillian Hunsberger (18:13) and Audrey Gordon (18:59) also were top 10 overall finishers as the champions had 92 points to Morgantown’s 119 and North Allegheny’s 192. Vincentian Academy freshman Marianne Abdalah was the runner-up in 17:49, while North Allegheny’s Madeleine Davison was next in 17:55 and Alexis O’Shea of West Allegheny was next in 18:05 as the top four all bested the former course record. Gary Olson of North East fought off Andrew Maxwell and John Danvers of Franklin to take home the gold medal in the boys Red race with a time of 16:59. His team, however, were not so lucky, as Knoch placed four in the top twenty overall to overtake North East for the team title 71-83. In the White race, the host West Middlesex defended their turf with a 28 point victory with four in the top twenty overall and 66 points to overtake Maplewood. Maplewood did have a 1-2-3 finish from the Parsons brothers Jeremy (16:25) and Jake (16:46) along with Hans Wentz (16:57). For the girls, North East cruised in the Red race with three of the top six finishers to score 46 points and win by 42 over Hickory. North East were led by Emma Verdonik and her big winning performance of 18:50 to win by over a minute against the field. In the white race, the West Middlesex girls completed the white race sweep, following in their boys team's footsteps and defending their home turf with a 54-80 win over Union City. Neshannock's Lizzie Manickas earned a comfortable victory, running 19:27 to win by 40 seconds over Kristen White of West Middlesex. Downingtown West had a deep top five help them prevail as team champions on a perfect early September day at Abington. Downingtown West placed four in the top fifteen and five in the top 25 overall to score 63 points and defeat Great Valley 63-93. Aislinn Devlin led the way for Downingtown West with a 2nd place finish while Elise Claffey led Great Valley with a 4th place finish. Individual honors went to Kara Steinke of Methacton, who got back on track after a 2nd place finish at the Viking Invitational last week. Steinke ran 18:03 to outpace the field by 17 seconds. Kaelyn Heinicke of Council Rock North got the broze medal with a time of 18:58. In the boys race, six guys broke the 16 minute mark with Chris Cummings of West Chester East coming close to breaking 15:30 on his way to victory. His time of 15:31 was 10 seconds better than Chris Kazanjian of Penncrest (his 2nd silver medal winning performance in a row) and his brother Matt was a second behind him for 3rd (15:42). The team race was very close between teams looking to contend for state qualifying spots come late October. West Chester East survived a 74 point total from their 5th runner to defeat Penncrest by 3 points 114-117. 3rd place went to Downingtown West with 123 points, despite having the closest 1-5 out of the top three teams. Although many of the TOP girls teams and individuals will be at the PTXC5 meet at Kutztown, 29 girls teams will run at the Abington Invitational. 3 teams will get trophies in the Varsity race. COUNCIL ROCK NORTH(the winner of the Robbins Invitational beating PA #10 Dallas and last year’s CHAMPION) is the favorite! GREAT VALLEY(3rd 2012) and STRATH HAVEN(PA #9)(5th 2012) look likely to take home the other 2 trophies. Certainly in the hunt are DOWNINGTOWN WEST, GWYNNED MERCY(2012 DISTRICT 1 AA CHAMP)(6th 2012) and MOUNT ST JOSEPH(2nd 2012). As for the individual first place trophy, Steinke(METH 12) looks to be the front runner. She was 2nd in 2011 and first in 2012, and just finished 2nd at Sharp , barely losing to Sheva(PENNR 11). Others with an outside shot are...., , Claffey(GRV 11)(6th 2012), Heinecke(CRN 12)(4th 2012)(2nd at CLIFF ROBBINS 2013), and Wheeler(NAZ 12)(4th AA DISTRICT 1 2012). St Joe's Prep boys had a 2-3 finish from Isaiah Fisher and Joseph Pisacano propel them to a 10 point victory over Palmyra 65-75. Central York stayed close to the top two teams but had to settle for 3rd with a score of 78 points. JD Groff of Central York ran 16:19 to win the gold medal over Fisher by 13 seconds. For the girls, defending AA state champions Palmyra got their season off to a flying start! 67 seconds separated their top five runners and their score of 31 points was 44 better than 2nd place Oxford. Palmya were led by a 1-2-3 finish from champion Miranda Salvo (19:34), Kelsei Bixler (19:34) and Maria Tukis (19:41). Solanco's Natalie Crum held on as best as possible to the trio, but had to settle for 4th in 19:45. They say that when you compete against the best, the best gets brought out of you. That statement certainly applied Saturday, as a tougher, deeper PTXC field did not break down defending champion Kennedy Weisner of Elk County Catholic, but pushed her to a performance that her optimistic about her chances of bettering her 2012 campaign. 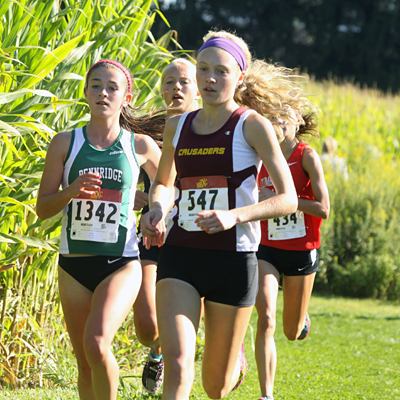 In previous seasons, Weisner had a race under her belt before the annual PTXC meet. This time around she was starting her season at Kutztown. The lack of a tune up race didn't have a negative impact on her performance. Weisner produced an insurmountable gap from the chasing trio of Elizabeth Chikotas of Saucon Valley, Mady Clahane of Cumberland Valley and Marissa Sheva of Pennridge before the first mile was even completed. She powered through the 2nd half of the course as if she was in midseason form and her final time would suggest she is way ahead of the game, much to her delight. "I'm feeling really good about running that time this early," said the Class A champion. "It's my PR. The course was great, the weather was great, and I felt great." And she was great. Her personal best of 17:49 beats the course record she set last year of 18:24, a 35 second improvement. In the brief history of the meet being run at Kutztown, that's better than PA alums Maria Seykora, Sara Sargent and 2011 Foot Locker Northeast Champion Angel Piccirillo (who ran her's two days after a tropical storm). Her previous lifetime best was 18:15 that she set on the opening day of last season on her way to a state championship and a Foot Locker Finals berth. "My summer training was good. My best workout was probably the 1000 meter repeats I did recently. I felt really strong." And her strength may help her repeat a PTXC trend. In the history of this meet, the winner of the girls gold race has gone on to qualify for the Foot Locker National Championships (Sargent, Cuffe, Piccirillo, Weisner). A repeat win and a lifetime best sets Weisner up to repeat that feat in 2013. Deluca's performance should certainly change his moderate goals of making it to states and seeing how far he can go in 2013. Past PTXC winners have used the platform to make themselves a household name in PA distance running. Wade Endress won PTXC 2 on his way to a fantastic senior season, Brendan Shearn won PTXC 3 and became a state champion and Foot Locker Finalist. Sam Williams won PTXC 4 and was instrumental in Northeast Bradford winning the first ever boys Class A championship. Dominic Deluca finished behind Williams last year, but this time around, Deluca got his win. "I came down here last year and raced really well, but this year I hit it out of the park," said the Dallas senior. His performance of 15:43 was the first performance under 16 minutes since the move to the Kutztown layout in 2011. It was also the first time he has broken 16 minutes in his career, coming close at this meet a year ago (16:07). "I've done a lot more running this summer than last year," said the Ed Narkiewicz league champion. "We backed everything up a week, so we haven't really done any workouts. But I do love hill workouts." Deluca starting using those hill workouts to great effect at the 2k mark, as he made his move to try and pull away from strong kickers such as runner up Jeff Groh of Lower Dauphin. The senior attacked the back rolling hills as his competitors attempted to gain back some of the ground they lost earlier in the race, but Deluca was not going to be caught on this day. "I didn't empty the tank completely, but I look forward to doing that very soon and seeing what I can do." When he does empty that tank, he can potentially join the class of PTXC champions who have succeeded on the highest level. New Pennsbury girls head coach Greg Sargent was pleased with his sqaud after their PTXC 5 performance. The three time defending AAA champions had a 1-5 spread of 55 seconds and scored 84 points to win by 74 points over district rivals Central Bucks West and Chambersburg. Olivia Sargent is now the new Sargent leading the Falcons. Her 8th place finish marks the 3rd time at a PTXC race that either Olivia or Sara were the first runners to score for their team. She led a sqaud that features returning state team title medal winners Erica Gray and Hannah Molloy. The scoring five of Pennsbury all ran 20:00 or faster on the Kutztown layout. Coach Sargent didn't to get too excited about the victory, knowing full well that there is still a long way to go. "It was a good day today," said the coach. "The group ran well today. It was such a nice day out and the course was great. We will see how we do at the next meet. It's early"
Central Bucks West were level on points with Chambersburg with 158, but earned 2nd on the 6th runner tiebreaker. CB West returned five of their top seven from their 3rd place finish a year ago. They were led by Maddie Villalba and Meghan Iatarola. Their scoring five finished inside the top fifty overall, a good indicator for their chances moving forward. Chambersburg placed two in the top twenty led by Courtney Group's 10th place finish. The district 3 sqaud is led by a top three of seniors who have state meet experience who will look to guide their younger teammates back to the state finals in November. Lower Dauphin were a team to watch according to some coaches heading into the season. When you have a team with a lot of experience and arguably one of the best 1-2 combinations in the state, there's always hope for optimism. Runner up Jeff Groh (15:48) and 6th place finisher Cole Nissley (16:05) set the pace for Lower Dauphin to win the team title with 77 points to win by 15 over Severna Park (MD). Both of their performances would have won the PTXC individual title each of the past two seasons. The team placed four in the top fifteen, which will help them in big races throughout the season. Severna Park kept it close with a better 1-5 spread and better 5th runner, but Lower Dauphin will have time to piece the back end of the team together. Red Land earned 3rd place honors for the 2nd year in a row at PTXC with 123 points with two runners inside the top 12 overall. Lower Dauphin held off class A powerhouse Central Cambria by one point, 82-83 to win the Blue race team title. The Red Devils of Central Cambria made their return to PTXC to get an idea of how the team stacked up against some other smaller division school. Head coach Randy Wilson credits their early season success to a new attitude from his younger runners. "Since the summer, the younger runners have wanted to put in a full summer of training," said the three time AA state champion. "Their dedication is something that has changed the attitude of the team. Our teams have always had the talent to succeed, but we are excited about where this team can go due to their incredible work ethic." The team were led by three freshmen on Saturday. Samantha Koss, Sydney Gilkey and Jordan Hayward all finished in the top twenty with two others inside the top 35. Despite the graduation of 2012 Class A runner up Alyssa Brandis, coach Wilson believes the summer dedication has improved the overall quality of the team. "We had a front runner last year, but we would sometimes struggle behind her," said Wilson. "So far this season, we have performed much better as a group. Training together since June has been a big catalyst for that. We ran well today and I think we are on track for a good season." Having young runners in a program that has had been very successful in years past, but a seize the opportunity attitude in the 2013 Red Devils will keep this team in the mix for a title come November. 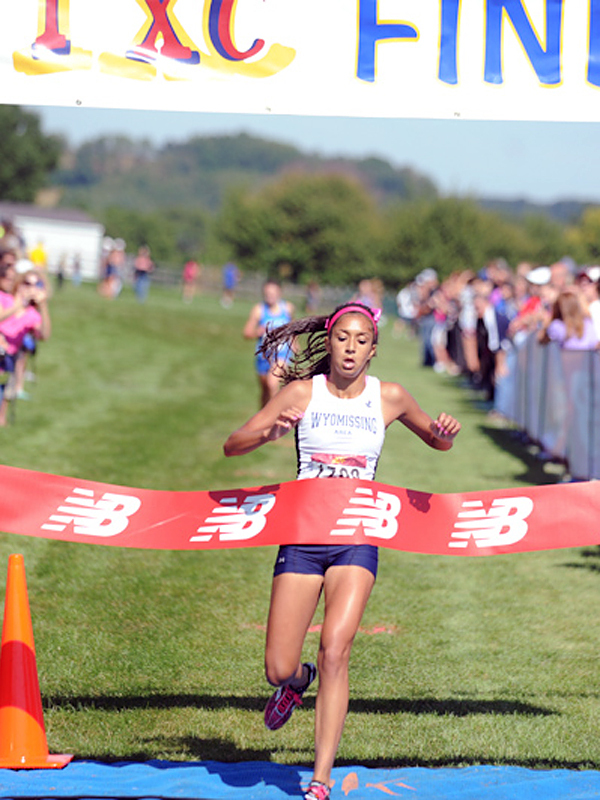 In the girls blue race, Devi Jagadesan of Wyomissing held off Lower Dauphin's Ella Breidenstine to take home the individual title with a time of 19:46, 5 seconds better than Jagadesan. 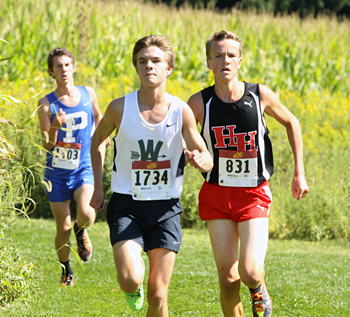 Casey Comber of Hatboro-Horsham went through an early season battle in the boys blue race. Surrounded by a large group of runners in the front pack, the junior picked his spot before he made his move to make the race his. "I knew I wanted to go out with the lead pack," said the Blue race winner. "They were getting weaker because they were getting slower around the back end. At the two mile mark I started to kick it in." His move was a risk since he was feeling a little tired on the back hills about half way through. He did manage to hang on and take the victory in a time of 16:46. Despite winning, the junior is aware of the tough road that lies ahead if he wants to mix it up with some of district 1's best runners. "I'm on my way, but I am not there yet. 16:46 is pretty good, but it is not quite where I want to be," said Comber. "District 1 has a lot of quick runners. There's a lot of quick runners that I won't be able to run with just yet, but it's all about racing against the right people and seeing what you can do. Go out fast with the right guys and see what happens." A victory at one of the premier meets in the state is one way Comber can set himself up to achieve his goals of a top three league finish and a state qualifying berth. The PTXC middle school race is a great opportunity for young runners to feel the atmosphere of a big high school invitational without the expectations of performing as well as their older peers. The young boys and girls kicked off the festivities and created highlights of their own. 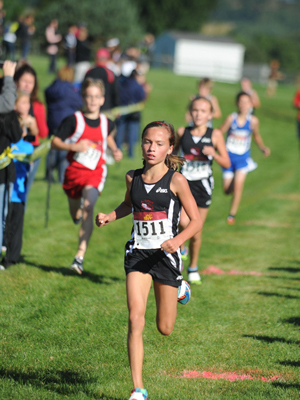 The Saucon Valley middle school girls teams were very dominant in tackling the Kutztown course, taking five of the top seven overall female places to score an incredible 17 points. The 1-2 7th grade sister combination of champion Kiele (10:03 for 2500 meters) and Brooke Reifenstahl (10:05) set the pace with Alexa Chiakowsky completing the 1-2-3 sweep 17 seconds behind them. The 17 points is a meet record for the middle school girls race and their 1-5 average was 46 seconds. The boys competition was a closer affair in the team title race. Cedar Crest managed to hold off a strong top three of Elk Lake to win the team title by 6 point, 64-70. Elk Lake had the individual champion in Cody Oswald, who shattered the nine minute barrier with a time of 8:53. Elk Lake had three of the top six finishers in the race, two of them 8th graders, which is a good sign for the future of the Class A district 2 program. Cedar Crest countered with four in the top fifteen overall and had six in the top 25 overall to help seal the title. 177 runners competed in the 2500 meter middle school mixed race, the biggest field PTXC has had in the 3 years at Kutztown University. Flash Highlights: For the first time, PTXC had a repeat champion. Senior Kennedy Weisner of Elk County Catholic took over the gold race about 1000 meters into it and never looked back. Her time of 17:49 set a new course record. Elizabeth Chikotas of Saucon Valley took runner up honors behind Weisner in 18:03 while Mady Clahane of Cumberland Valley improved on her 4th place finish with a 3rd place performance in 18:09. Marissa Sheva of Pennridge ran 18:28 for 4th and sophomore Mikayla Stoudt of Parkland ran 18:49 to finish 5th. Pennsbury started their title defense with a comfortable team victory, scoring 84 points to defeat Central Bucks West and Chambersburg with a 55 second 1-5 spread. In the boys gold race, Dominic Deluca of Dallas took home the gold medal, setting a new course record with a time of 15:43. Jeff Groh of Lower Dauphin was close behind in 2nd in 15:48. Andrew Milliron of Jefferson, WV ran 15:51 to finish 3rd, Colin Abert of Easton ran 15:59 to finish 4th and Ryan Forsyth of Severna Park rounded out the top five in 16:02. Lower Dauphin had four in the top fiftenn overall to hold off Severna Park for the team title 77-92. In the girls blue race, Devi Jagadesan of Wyomissing held off Lower Dauphin's Ella Breidenstine to take home the individual title with a time of 19:46, 5 seconds better than Jagadesan. Keirra Zack of Northern ran 20:00 even to take the bronze medal. In the team standings, Lower Dauphin were victorious over Central Cambria by one point, 82-83 thanks to having two runners in the top ten. The boys blue race was won by Hatboro Horsham's Casey Comber in a time of 16:46 to win by 15 seconds over Kyle Shinn of Wyomissing Area. George Balser of Paul VI finished 3rd in 17:03. Coatesville comfortably won the team title over their district rivals Hatboro Horsham 81-122 thanks to three finishers inside the top eleven overall. The middle school girl race was dominated by Saucon Valley. The district 11 team had four of the top five finishers led by the 1-2 sibling combination of champion Kiele Riefenstahl (10:03) and her sister Brooke (10:05) to score an incredible 17 points. For the boys, Cody Oswald of Elk Lake ran 8:53 to win the race and was the only runner under the 9 minute mark. Tyler Leeser of Milton Area ran 9:01 to finish 2nd. Cedar Crest narrowly overtook Elk Lake for the team title with a 64-70 victory. 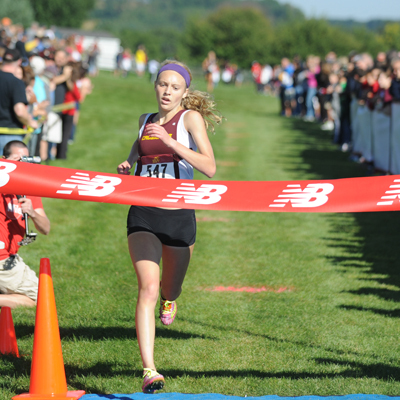 PTXC 5 will feature teams from eight of Pennsylvania's twelve districts and four states. West Virginia will be represented at the meet for the very first time. West Virginia is the 6th state to ever feature at a PTXC competition. The girls Gold race will feautre defending PTXC champions and 2012 AA runners up Dallas out of district 2. Last season, this meet got Dallas up and running towards their 2nd place finish. Regan Rome will lead the way and will look to improve on her 3rd place finish from this race last year. Looking to take Dallas off their throne will be 3 time defending AAA girls champions Pennsbury. The Falcons will start their road to their 4th straight state championship, a feat that has never been accomplished in PA history. Pennsbury won the inaugural PTXC meet back in 2009 and were runners up in 2011. Even though Sara Sargent has moved on to the University of Virginia, she leaves behind her sister Olivia and a team that has come up huge in big races time and time again. AAA bronze medalists Central Bucks West will return to PTXC after a 4th place finish here a year ago. They finished in the top three at last week's Viking Invitational at Archbishop Wood. Speaking of last week's hosts, Wood will enter the gold race. The Philadelphia Catholic League champions will be looking to get their season going strongly against some good competition. A veteran varsity sqaud likes to keep the 1-5 spread low, which brought them plenty of success in 2012. Individually, the race is loaded with elite PA runners. The top five finishers from last year's race have returned to give the Kutztown course another run! 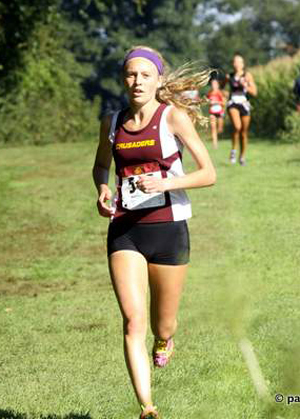 Defending champion and Foot Locker finalist Kennedy Weisner of Elk County Catholic will be making her 2013 debut on Saturday. 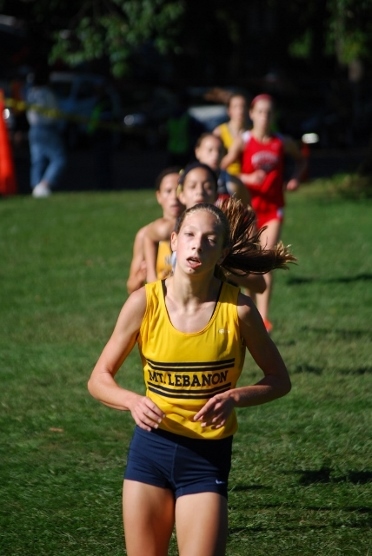 Last season, she ran 18:24, ten seconds better than Penn Manor's Greta Lindsley. The senior finished the spring track season on a very high note and will look to take home the individual gold at PTXC 5. Rome is also a Foot Locker Finalist who was 3rd in this race a year ago. Rome has had many 3rd place finishes in the past year. Will this race be her opportunity to break that trend and get the win to help her team defend the title? Mady Clahane of Cumberland Valley was one of the freshmen of the year in 2012-13. Her 4th place finish here put her name quickly on the PA map. What will she do for an encore? Elizabeth Chikotas of Saucon Valley was the 2013 AA silver medalist in the 3200 meter run a year ago. The senior has a good mix of speed and endurance. PTXC 5 can be her chance to put her name in the conversation with some of the state's established stars. Finally, added to the mix will be Pennridge junior Marissa Sheva. The 2013 indoor mile champion and 2012 AAA cross country runner up kicked off her junior year with a comfortable win at the Viking Invitational last week. Sheva has been in the elite class since her silver medal 1600 meter performace during the 2012 spring season. Can she steal the win at her PTXC debut? The boys race will also have the PTXC 4 champion returning to defend their title. 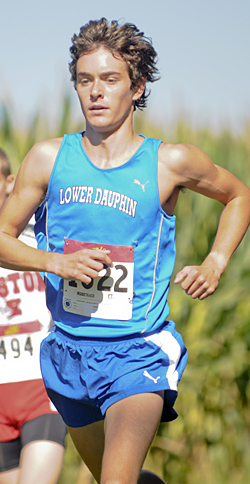 Lower Dauphin returns to PTXC as a team that has the potential to make a name for themselves in the 2013 season. The combination of Jeff Groh (4th) and Cole Nissley (8th) could be one of the best 1-2 combinations in the state. PTXC 5 will be a good place to put that partnership to the test against a good field. Hershey finished 5 points behind Lower Dauphin in the Gold race a year ago and have returned looking to improve on that finish. Cumberland Valley finished 3rd last year but were level on points with Hershey. The district 3 rivals will all get an early season look at each other. Who will get the early boost ahead of the district 3 pack? Individually, Dominic Deluca of Dallas comes back to PTXC after finishing 2nd in the race a year ago. The senior is one of two returning top ten finishers returning to the meet. Easton Area will be in the meet and will be led by Colin Abert of Easton, who is coming off a strong 2013 track season. District rivals and 2012 state qualifiers Parkland will be participating in the Gold race and will look for a good start on their way back to the state meet in November. Hatboro Horsham will look to move on from the graduation of Conner Quinn and become a team on the rise in 2013 with a new group of runners who are hungry to achieve success. PTXC 5 will be their first opportunity to achieve just that. North Penn's boys foursome held off a strong challenge from Penn Charter and Pennsbury to win the 4x2mile relay event by six seconds over their chasers. Each of the three teams had the lead at one of the exchanges, but a 10:53 performance by North Penn's anchor leg helped them come from behind to win. For the girls, Central Bucks South and Lenape finished with the exact same relay time at the finish. Lenape made up a 47 second gap to break even with the district 1 squad. Council Rock South earned bronze medal honors. The Kennett boys came away as the winners of the inaugural Farmer Jones relays at West Chester Rustin, defeating the host by 58 seconds with a 4x2400 meter relay time of 32:58. For the girls, Unionville swept the first three places in the event, with the winning team running 37:18 to beat out their other foursome by 38 seconds and the 3rd place group of four by almost 90 seconds. 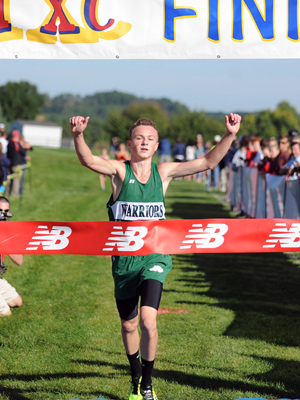 Host Twin Valley boys put on an impressive performance on their home course to keep the team title on their campus. Twin Valley had five in the top nine overall with a 38 second spread to score 24 points and win by 30 over runners up Downingtown East. The girls of Downingtown East had a better day than their male counterparts, defeating Cardinal O'Hara by the narrowest of margins to take home the team title 42-43. Cardinal O'Hara had five in the top fifteen, but Downingtown East had three in the top ten overall to edge the win. Individually, Billy Caldwell of Downingtown East ran 16:59 to win the gold medal by 5 seconds over Twin Valley's Colby Geary. Geary's teammate Kris Lizins finished 3rd. For the girls, Anja Weiler of Downingtown East won the individual crown in 19:51 to hold off Amy Kelly of Cardinal O'Hara by 8 seconds. Lexi VanBlunk of Downingtown East ran 20:13 to finish 3rd.